Me: Can I quote you on the "weird crotch" thing? Me: So it was trying to be a drop crotch romper? Kati: It felt like I was wearing athletic shorts! Me: So it was open and breezy? Kati: Yes! You should quote yourself on that one. Me: I think it's cute on you. Kati: Maybe I needed a belt or something. I almost bought it, but I knew I'd never wear it. I thought it was funny she said "athletic shorts" instead of "gym shorts," as athletic shorts immediately conjure up memories of those big, baggy shorts we'd be stuck wearing for track in junior high school. And I understand the never-wear-it thing. 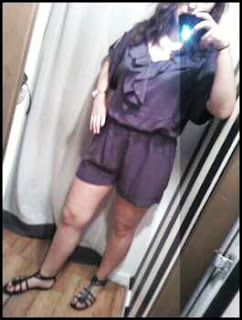 Kati is tempted by the romper look, but this one wasn't quite there for her. She showed great restraint. 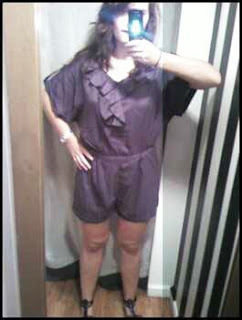 Someone needs to go get it, though, especially as Kati said all that purple-ruffled cuteness is around $48. I think "Breezy Romper" would be a great band name. Oh I so love Meridian, but I must admit that many of their pieces have fit and construction issues. For their prices though its bearable, you just have to pick through stuff carefully.